This outfit is for the teenage me who would have loved it but been too scared to wear it. Well teen Shelley; you’re 24 now & couldn’t give a damn what people think! Plus it’s halloween & why shouldn’t I be wearing something a little bit spooky? 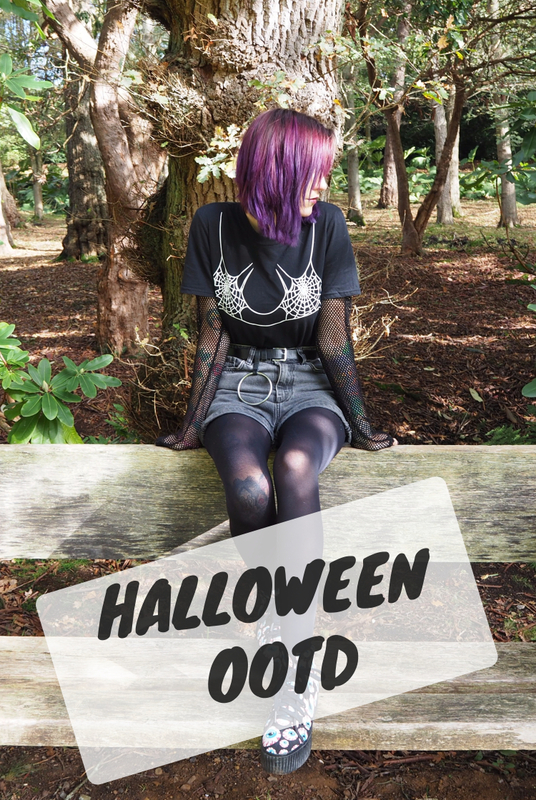 Jacob & I ventured out to Virginia water lake once again & decided to get some blogoween photos done. Our plans had changed & it was a surprisingly sunny day so it wasn’t freezing for once. After the disastrous attempt to get some decent flatlays in the winter light it was nice to get some decent photos. I may have gotten a few funny looks but I love this outfit. This top jumped out at me & I love the concept of a cobweb bra. It’s easy to chuck on & build outfits around. I decided to layer up with my fishnet crop top that I’ve had forever & luckily it wasn’t uncomfortable. I love how it turned out & it really suits this time of year. As for the bottoms I chucked on my go to shorts which are ridiculously comfortable & my o-ring belt is already attached to clinch in the waist. You definitely need to belt mom shorts in my mind just because they can look a bit too baggy otherwise. Shocker I’m wearing tights & actually covering up my leg sleeve. I’m not one to opt for tights but it was definitely weather appropriate & well they tie the outfit together. Onto my beloved Jeffrey Campbells’ which I have to admit haven’t been seeing too much love in the past few years. They were an impulse buy but very loved in my collection. I have way too many plain shoes so these really pop in my closet. Plus they are perfect for halloween. I honestly forgot how comfortable they are to wear even though they are platformed. This outfit is just perfect for halloween & I don’t think you need to go overboard when it comes to dressing causal for the occasion. A few small touches go a long way & of course monochrome looks are just a go to! I won’t be dressing up for Halloween this year so it’s nice to wear something a little themed in preparation for our movie marathon evening.